More than ten years after first arriving in Chad, over 360,000 Sudanese refugees are now dealing with a new reality. In the face of dramatic food ration cuts, and after years of shrinking support from the international community, aid agencies are pushing these refugees to become self-sufficient and more deeply integrated with their Chadian hosts. With the global humanitarian system overstretched, a more sustainable and targeted assistance strategy for this population would seem reasonable. But the early stages of this transition have encountered serious problems. These ration cuts, now in place for 18 months, have been devastating for already vulnerable households. Humanitarian funding has dried up and not been replaced by desperately-needed development activities. It is unrealistic to expect refugees to become selfsufficient in a place where livelihood opportunities are hard to find, government services are limited, cost of living is high, host community tensions are increasing, and most crucially, little development funding exists. It is time for the international community to recommit itself to this long-suffering population, and to do so in a sustainable way. Though its most recent civil war ended in 2009, Chad shares more than half of its borders with conflict-affected countries: Nigeria, the Central African Republic, Sudan, and Libya. After years of conflict between the Chadian President Idriss Déby and Sudanese President Omar al-Bashir, the two reached a rapprochement in 2010 that stabilized the country’s eastern border. Yet regional counterterrorism efforts, particularly with respect to Boko Haram, remain a primary focus of the Chadian government. The June 15, 2015 suicide bombings in the Chadian capital N’Djamena, which targeted both the police academy and the police headquarters, have heightened security protocols in and around the city. In addition to these security concerns, Chad faces both long-term development challenges and recent, acute economic concerns. Chad ranks 184th out of 187 countries in the UN’s Human Development Index. Living conditions for both refugees and host communities alike are very difficult, with food insecurity and a lack of livelihood opportunities just a few of the challenges they face. The price of oil, the country’s main export, has fallen roughly 40 percent since last year, and trade routes into Nigeria, Central African Republic, and Libya have been largely cut due to conflict. As a result, the World Bank reports that government spending on services and development will decline significantly in 2015, and could fall even further if Chad’s military campaign against Boko Haram expands. 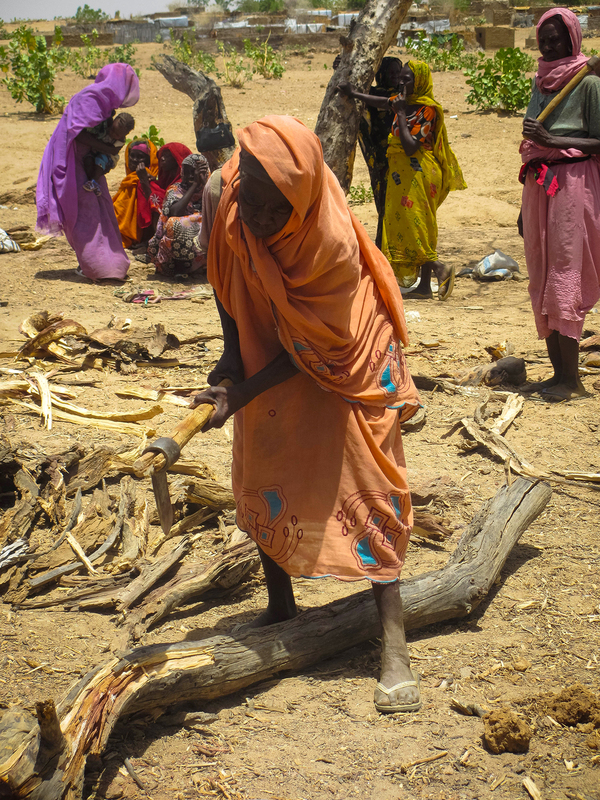 Women chopping wood at a firewood distribution location in Farchana refugee camp. The bundle of wood, at left, is what three families are expected to share for one month. A mother, daughter, and her children in Farchana refugee camp. The family is often forced to skip meals due to lack of food. Donors and the World Food Program (WFP) must immediately increase food rations to 2,100 kilocalories per day for vulnerable Sudanese refugees, until such time as assistance can be adjusted in line with region-wide household economic assessments. The UN Refugee Agency (UNHCR) and WFP should closely monitor the food security situation of Sudanese refugees after food assistance is adjusted. After 12 months, UNHCR and WFP should commission a full Joint Impact Evaluation to identify any necessary adjustments and to more fully understand and address coping mechanisms. Donors – especially the United States Agency for International Development, the German Federal Ministry for Economic Cooperation and Development, the Swiss Agency for Development and Cooperation, the European Union’s Directorate-General for International Cooperation and Development, and the World Bank – should provide dedicated funding for development and resilience initiatives in eastern Chad that benefit both Sudanese refugees and Chadian host communities. Donors should also work with the Chadian government to make sure these populations are prioritized in the country’s National Development Plan. The UN Development Program, the Food and Agriculture Organization, the UN Children’s Education Fund, and the UN Population Fund should deploy additional program staff to eastern Chad in accordance with their respective responsibilities under the UN Integrated Strategy for the Sahel, and should work with UNHCR to implement development and resilience initiatives on the basis of need. In refugee-hosting areas, donors and development agencies should prioritize efforts to improve water management, agricultural inputs and techniques, land management and dispute resolution, and women’s empowerment. 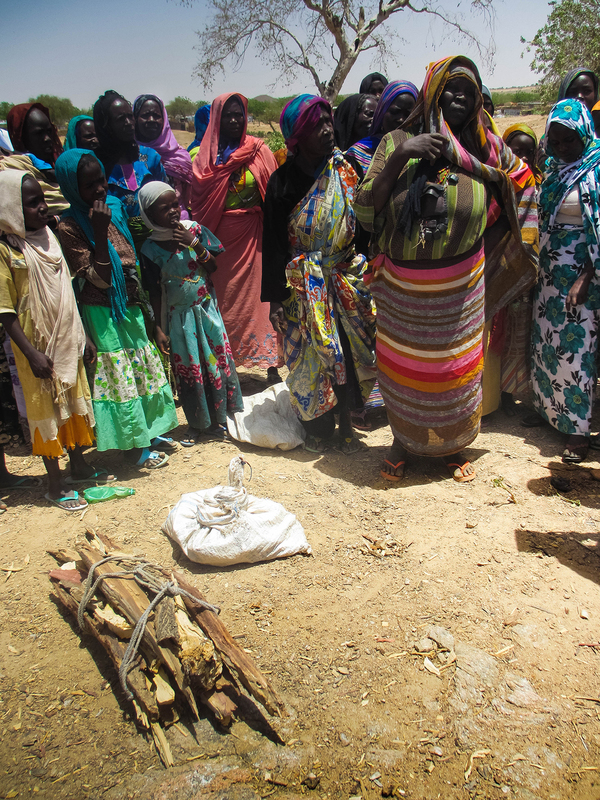 UNHCR should freeze its budget for core refugee protection and assistance in eastern Chad. Further cuts should only be considered once refugees begin receiving long-term support from development actors. The Chadian government should strengthen healthcare services in refugee-hosting areas. In particular, the government should accelerate the hiring process for healthcare workers with foreign qualifications and pay incentives to healthcare workers who accept postings in underserved areas. The Chadian government must pay for all necessary salaries and equipment for the Detachment for the Protection of Humanitarians and Refugees. Michael Boyce and Ann Hollingsworth visited Chad in May and June 2015. They met with refugees, host communities, humanitarians, development actors, and government officials in the regions of N’Djamena, Wadi Fira, and Ouaddaï.